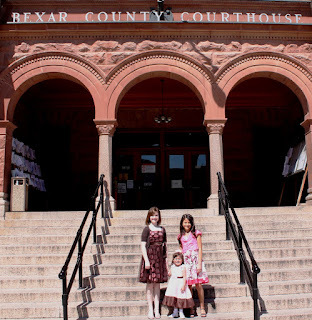 On this beautiful sunny Thursday in Texas, we attended family court in San Antonio, to readopt our two internationally adopted daughters and legally change their names. We also changed the middle name of our biological daughter, Mattie. Why did we do this? Our internationally adopted daughters became US Citizens the moment they stepped foot on US soil and their foreign adoption is recognized by the US, so there's no requirement for us to readopt. However, we want our daughters to have US birth certificates (Texas at that...WOOHOO! ), and that will allow us to have easy access to their birth certificates should the need ever arise. We also wanted our internationally adopted daughters' names to be legally changed to the names we gave them when they became forever members of our family. So, we went to family court and now everyone is OFFICIAL! YEEHAW! “Mery Elizabeth”: Beloved wished for child; chosen by God. When we adopted Meribeth, we had no intention of changing her name, but God showed us why it was important for us to give her a new name as she became a forever member of our family. God reminded us of many Biblical heroes who were given new names at significant times in their lives, and their new names reflected who they were in Christ as they were a new creation in Him. We held a beautiful bilingual name-changing ceremony for Meribeth after she had been in our family for about three months, when Meribeth was really struggling with how she fit into our family. God totally chose Meribeth’s name, and I LOVE it, and I LOVE the meaning and significance of both names together, which is why we call her “Meribeth”, the combination of Mery Elizabeth. While Meribeth didn’t care for her new name at the time it was given, she told me just yesterday how much she LOVES her new name and how happy she is to be Mery Elizabeth, our beloved Meribeth. “Christyn Joy”: One who holds Christ in her heart; pleasure, joyful in the Lord, being wished a happy life. “Madelaine Grace”: Devout follower of Christ (derived from Mary Magdalene); God’s grace, favor, blessing. For our biological daughter, Mattie, God laid it on our hearts to also give Mattie a new middle name since her original middle name had no significance as to who she is today. "Madelaine" (pronounced mad-a-LAYne) has significance because that is "Matt" and "Lorraine" crossed together, and it also is a derivative of Mary Magdalene, who is, of course, a devout follower of Christ. However, Mattie really deserved a significant middle name, one that reflects who she is in Christ. From the time that Mattie was very young, she has always had a heart of grace. She amazes me with the grace that she so freely grants to all she encounters. She has gracefully accepted and unconditionally loved her two new sisters, even when she suffered verbal and emotional abuse as her hurting older sister joined our family. She always responded with amazing grace. Mattie truly exhibits and extends grace in all she does, to all she meets, so for her 12th birthday, we surprised Mattie with a name change at a significant time in her life that gives significant meaning about who she is in Christ: She is our beautiful Madelaine Grace! Oh happy Day! Love the names! Congratulations to all! What a special day in court and outside. May your precious girls always be rooted and grounded in Christ and fulfill all His plans and purposes. Adoption days are such exciting events. I love the names. We also have a Mary Elizabeth. Y'all got great pics! Our judge didn't allow us the time to do that. Congrats to all your beautiful daughters!! !